Hundreds of militants in Nigeria have handed over weapons at a ceremony in the southern Delta region. The handover in Yenagoa, west of the oil city of Port Harcourt, took place after regional rebel leaders accepted an amnesty offer from the government. 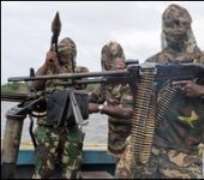 However a faction of Movement for the Emancipation of the Niger Delta (Mend), the main rebel group, denounced the offer and said it would resume attacks. Unrest in the region has seriously affected Nigeria's oil production. The weaponry handed over on Saturday included hundreds of assault rifles, a number of rocket launchers, and at least 12 gunboats. The BBC's Caroline Duffield in Yenagoa says it is unclear how many heavy weapons have been handed over, and many of those put on display appeared to be old and rusty. The senior Mend commanders who have accepted the amnesty offer include Ebikabowei Victor Ben, also known as General Boyloaf. "So long as the government has said they will give the people what the people want, I think we have to give peace a chance and see how soon or how real they will perform," he told the BBC's Focus on Africa radio programme. Gen Boyloaf has in the past been blamed for spectacular attacks against the oil industry in Bayelsa state. But earlier this month he met Nigerian President Umaru Yar'Adua and accepted his offer of an amnesty for Niger Delta militants. Gen Boyloaf and other militants have been fighting for a fairer share of the region's oil wealth for local people. Our correspondent says they have also made huge amounts of money from kidnappings and the theft of crude oil. But some Mend factions in neighbouring states have refused to sign up to the amnesty. One rebel group on Saturday said accused the government of "deceit" and said it would resume "ferocious attacks on the oil industry at the end of our ceasefire" on 15 September. Militant attacks have reduced Nigeria's out to 1.3m barrels per day. Nigeria's Opec quota is 2m. The rebels say proceeds from oil production have not benefited the region.